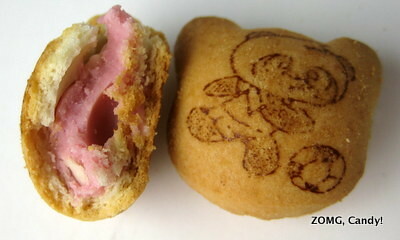 Hello Panda: Cute Cream-Filled Cookie Review! 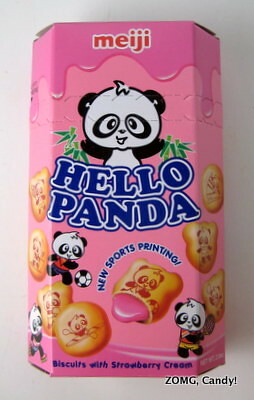 Hello Panda is Meiji’s answer to Lotte’s Koala’s March: cream-filled cookies imprinted with cute animal cartoons.Without too much research, it’s easy to notice that Hello Panda hails from Japan. I got a couple of boxes to try in my free MunchPak samples, first in Strawberry and the following month in Double Choco. I have also found them at my local Daiso. They have become increasingly popular in the US, so you may be able to find them at niche candy stores – not just Japanese markets! 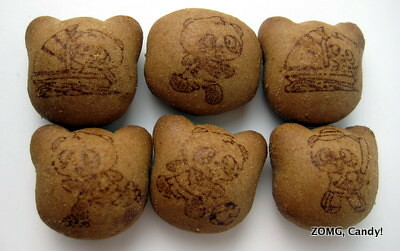 The Hello Panda biscuits were either round or round with ears, like teddy bear heads. The Strawberry flavor was vanilla biscuits with strawberry cream inside, while Double Chocos were double chocolate (obviously). Both the biscuits and the “choco” cream are chocolate flavored. 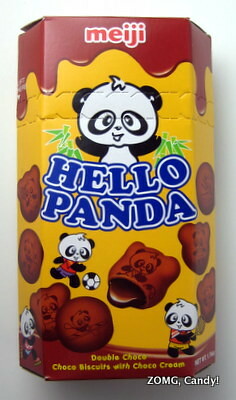 Compared to the Koala’s March, the Hello Pandas had a more substantial crunch and a greater cookie to filling ratio. Strawberry’s biscuit was lightly sweet, while the center strawberry cream had the texture of a solid frosting and a floral sweetness to its artificial strawberry flavor. 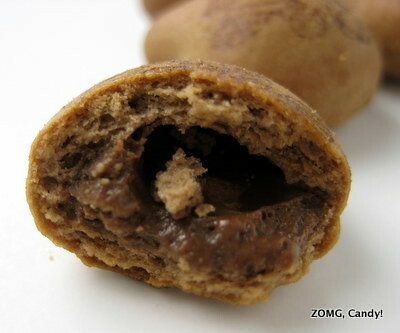 The chocolate cookie of the Double Choco was darker in both appearance and flavor. It had a slight cocoa bittersweetness, like a mild Oreo cookie, and its chocolate filling was creamy with a slightly greasy feel. I liked the Double Choco better than the Strawberry, which was too artificially floral for my taste. I did wish, however, that the Double Choco had more intensity of chocolate flavor and wasn’t quite so greasy. An O for both.